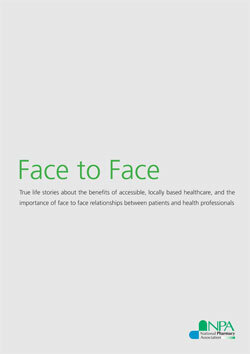 The NPA's new report, Face to Face, brings together true life stories about the benefits of accessible, locally based healthcare, and shows the importance of face to face relationships between patients and health professionals. It’s a reminder that the human touch matters in healthcare. Patient groups and other stakeholders are invited to consider the policy and practice implications of this new report.